The 11th annual International Conference of Education, Research and Innovation (ICERI) took place on November 12-14 in the beautiful city of Seville in Spain. This year, more than 700 participants from 75 different countries attended the conference. This was a unique occasion to meet new and old colleagues and share experiences on the conference motto: Meeting the challenges of 21st century learning. 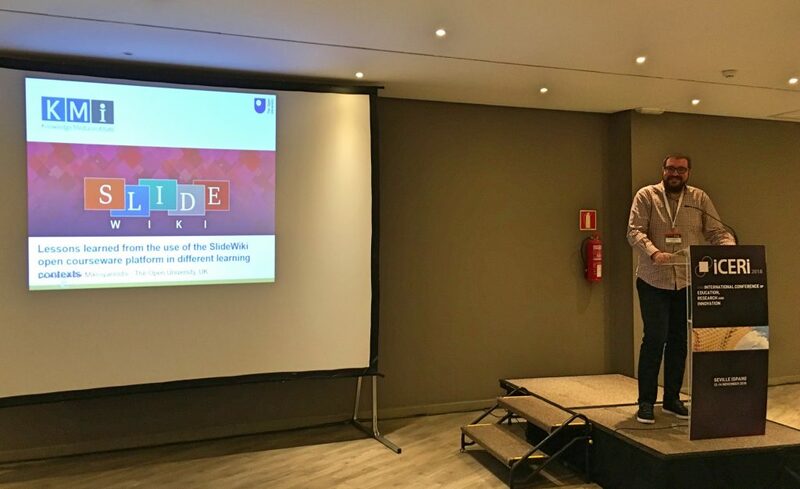 Alexander Mikroyannidis represented the SlideWiki project by presenting a paper about the lessons learned from the use of the SlideWiki platform in different learning contexts. The SlideWiki platform is fostering open education by supporting the collaborative authoring, sharing, reusing and remixing of open educational content online. This paper presents the lessons learned from piloting the SlideWiki platform in different learning contexts and scenarios. The paper was co-authored by the partners subcontracted by the Open University to conduct pilots within their respective organisations, as part of the community outreach initiative of the SlideWiki project. This initiative has offered opportunities to extend the user base of the SlideWiki platform and gather valuable feedback from different communities of learners and educators about their open education needs. The pre-print of the paper is available here.